According to the CDC, Centers for Disease Control and Prevention, almost 27 percent of Americans age 65 or older had diabetes in 2010. Diabetic retinopathy is an eye disease affecting diabetics, where the fragile vascular network that supplies the retina- the tissue responsible for forming a clear picture- becomes damaged and leaks. Early diabetic retinopathy has no noticeable symptoms, so it is important for all of those diagnosed with diabetes to be watched annually. 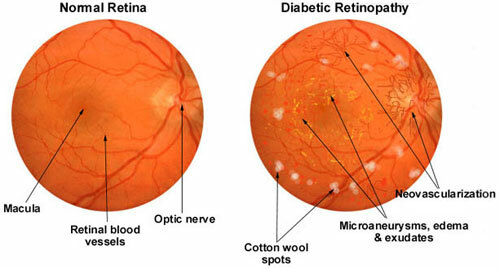 And in fact, the longer someone has diabetes, the more likely they are to have retinopathy (damage to the retina). People with diabetes are 25 times more likely to lose vision than those who are not diabetic, according to the American Academy of Ophthalmology. Both the American Optometric Association and the American Academy of Ophthalmology recommend that patients with diabetes get annual eye health exams.